In order to minimize scrap and to generally work more cost-efficient, Kai Altstaedt decided to purchase a STEPCRAFT-2/420 and experienced a “creative explosion”. To counterbalance his job as a project manager at a concern in the automotive sector, Kai Altstaedt produces docking stations out of wood for different devices in his free time. He is not only fascinated by the construction of parts but also by their economic construction. 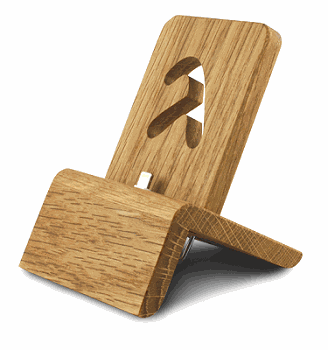 With Holz Design Altstaedt he distributes his products on various internet platforms. The idea for the docking station came Kai Alststaedt when he observed the numerous cables that had accumulated on his desk over the time. One of them belonged to his smartphone and was supplying it with electricity. “The cable clutter bugged me. That is when I thought: I need a combined charging and docking station. Besides, I enjoy designing,” explains the project manager. He started to construct a wooding housing and integrated the electronics of a charging station he had bought. But he was not satisfied with the overall result. “I noticed that the charging station did not work with other smartphones. This irritated and itched me of course,” states Kai Alstaedt. What followed was a phase of tinkering where he not only experimented with different sorts of woods such as walnut, oak, beech and mahagony, but where he also tried out various designs. “I wanted to use the supplied charging cable of the smartphone. This is now guided through the lower opening and secured with the help of a screwed insert,” he explains. Additionally, the fixture should be adjustable to numerous different mobile phones and should allow for them to be operated during charging. The result was a prototype of the first Lambda docking station that could be adapted to the respective smartphone and the selected cover thanks to its adjustable rear panel. When designing his new product, the BoMoDo, the project manager could use the advantages of CNC technology and the knowledge he gained from the development of the Lambda from the very beginning. This is why the new docking station for e-cigarettes could be equipped with a turnable base which is a necessity as the USB port of these devices is either located sidewise or at the buttom of the housing. Due to the adjustable design most of the models can be connected without any difficulty. Overall, Kai Altstaedt could reduce the time needed to invest for the development of his models significantly with the use of CNC technology. “Design iterations can be realized much faster,” explains the project manager and goes on: “Creating a milling template, transferring it onto wood, sawing and filing until it fits once took me half a day.” Today, he firstly changes his model in SketchUp and saves it as a DXF file before importing it into ESTLcam and later into the full version of the machine control software WinPC-NC to mill it on his STEPCRAFT-2/420. “It is now possible for me to change the product design in just one afternoon. Previously, I could develop a unique copy in the same time but it was still a long way to series-production readiness,” remembers Kai Altstaedt. Therefore, it is hardly surprising that that he could reduce the overall development time of nine months for the Lambda to only two months for the BoMoDo even though the design was more elaborate due to the increased number of screws. “Without CNC technology I would not be able to realize such designs ad products in regard to production expenditure. The hourly gross rate that I could earn with my models would be disastrous,” explains the project manager. Thus, he optimized the production of the BoMoDo to the extent that the article requires only a double-digit numbers of minutes. All necessary components are milled out of a 20 cm long piece of wood in just one single process. This leaves only a couple of manual work steps to the finished product. With the STEPCRAFT-2/420 the project manager could accelerate his development and production process and could reduce the error rate as well as the scrap to a minimum. This led to cost optimizations that increased his hourly gross rate. “It is an extended hobby and that is what is should stay. However, I would not have any fun if the production would not realizable in a commercial way,” states Kai Altstaedt. This is why the future abandonment of CNC-technology is especially one thing for him – unthinkable.